IBM's Type 011 Electric Punch. 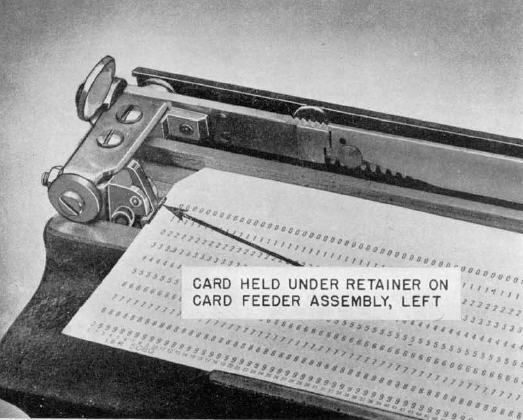 Introduced in 1923, when IBM cards had 45 columns and round holes. This was the first punch with electric power; holes are punched by electromagnets rather than muscle power, at a great reduction in operator fatigue. 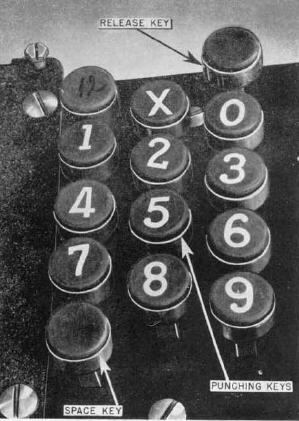 Strictly numeric, the machine also includes a tabbing feature similar to typewriter tab stops. Click to enlarge. The keyboard of the Type 011 has 12 keys, one for each of the 12 rows of the card, plus a Release and a Space key. 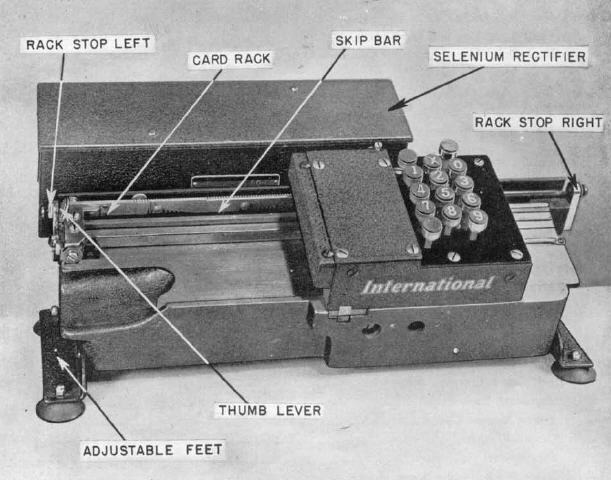 Each key press punchs a hole in the corresponding row and advances the card one column. The X (11) key also tabs to the next tab stop (if any). Click to enlarge. This figure shows an 80-column card positioned for punching. Thus one must suppose that after 1928, the Type 011 was engineered for 80-column cards with rectangular holes. Photos: IBM Accounting Machines, Customeer Engineer Manual of Instruction: Electric Punch Type 011, International Business Machines Corporation, New York, New York (undated).